Pioneers in the industry, we offer self-pressuring nitrogen storage dewar from India. We suplies quality Self-Pressurising Nitrogen Storage Dewar which are safe and easy to install. It is compact in size and is a corrosion resistant. It is light weighted and It is a readily transported source of nitrogen gas. It is convenient to use and is available at an economical market price. 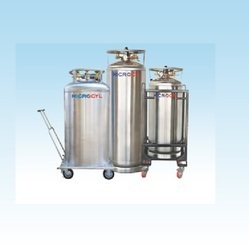 It is highly efficient in carrying liquid gas in liquid form effectively. Liquid cylinders can be used to get gas in liquid and as well as gases form up to 22 Bar. Refrigeration, Cryogenic grinding of plastics, Food freezing, Welding, Hospitals, Labortory and R & D centre,etc. Range 55 lit to 200 liters. Pressure 5 Bar to 22 Bar. Stainless Steel body fitted with PRV system. Can be used for Liquid Argon, Oxygen, Nitrogen and Co2 gas.